It appears that Disney has opened up the ability to customize MagicBands and start selecting Fastpass+ options to all Disney resort guests for guests checking in on or before October 31st, although they are being released over the coming weeks. Check the schedule below to see if you qualify. Note: Nothing has been scheduled for November at this point. You must have a reservation at one of the following resorts, checking in as specified. To make Fastpass+ selections, you must also have a valid ticket registered in your My Disney Experience profile. And there are lots of reports of difficulties getting some tickets registered, as they are still working out all the bugs. At a minimum, they should be able to get you set when you check in, and then you can make selections then, but they are trying to iron out all the options and tickets. No word yet on Annual Passholders and the general public getting access. I was not one of the few who got to use the new MagicBands during August testing, but I did see them – not many though. I estimate there was less than 5% of guests actually wearing the bands during the 10 days I was on the lookout…possibly quite a bit less than 5%. I also didn’t see any more “Iconic Gray” bands than I did other colors, which makes me wonder if they didn’t give too many of them to people who didn’t fully register for the testing – or they simply didn’t use them. In addition, I only saw the MagicBands actually USED twice, at Buzz Lightyear’s Space Ranger Spin and Haunted Mansion. They seemed to work reasonably fast. I spoke with a CM managing the Fastpass+ line at Spaceship Earth, and asked how many people had been using it. “None today,” was his response…and this was mid-afternoon. I didn’t see it used for purchases, but expect that it works about the same as the cards…fast, but the PIN entry pads can be a bit quirky. Testing expands in a few days. The four existing resorts – Animal Kingdom Lodge, Contemporary, Yacht Club and Pop Century will be joined by the Beach Club, Art of Animation, Polynesian and Port Orleans Riverside. In addition, the Beach Club Villas and the DVC rooms in the Jambo House at AKL, but not Kidani Village, will be included, for September and October. 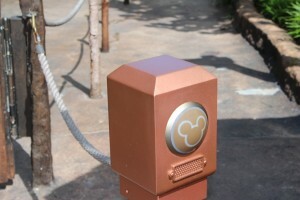 Some of the DIS folks managed to take part in one of the tests of MagicBands and Fastpass+ – check it out here. I’ve been asked why I haven’t given an update on the recent MagicBand and Fastpass+ testing that’s been going on. Honestly, there has been a lot to keep track of – and not much to report that’s concrete. Recently, guests staying at the Animal Kingdom Lodge and Contemporary Resort checkin in on certain days were able to receive MagicBands and take part in the first full guest MagicBand field test. They were allowed to schedule up to three Fastpass+ experiences per day during the test via My Disney Experience (DMX) web site/app. This included all the existing Fastpass attractions, plus a number of other attractions and some more unique items like reserved fireworks and parade areas. In general, the testing has worked well and been well received, but one thing to note…guests participating in the tests have also been given a “normal” KTTW card as a backup device and to use at table service locations for room charges as they are not yet fully equipped to handle MagicBands. But these cards also work in the current Fastpass kiosks, so the guests were able to use regular Fastpass in addition to Fastpass+, without any interference from each other. It is uncertain that this will be the case when it is fully rolled out, as I’m still hearing information that “regular Fastpass” will go away, and information is still uncertain about whether you will be able to use Fastpass+ similar to Fastpass on the same day. One thing that did come out of testing – although you can only pick a given attraction once per day, after you’ve used the Fastpass+ for an attraction, if you have any remaining you can change a previous selection to the same attraction. Another test is currently going on with some guests staying at Bay Lake Tower (the first one including DVC members), and then for most of August it appears that most guests staying at Animal Kingdom Lodge, Contemporary Resort, Pop Century and Yacht Club will be optionally participating. However there is a lot of conflicting information as to whether they will be able to use regular Fastpass on the same day as Fastpass+. Some guests calling for info and support have been told adamantly no, others certainly yes, and still others are told they can use it as long as they don’t book any Fastpass+ that day. Shaun Thompson at The DIS managed to check out an actual MagicBand and talk to the cast members about them, and found out lot more details on the MagicBands themselves, including color choices, etc. From 10 days prior to check-in, any time after you book your reservation, you will be able to choose your colors and either receive them at the resort or have them sent to you (no word if there is an additional charge, but it seems likely). From 9-5 days, you can still choose a color but you can only pick them up at the resort. The battery for the active transmitter is good for 2-3 years. After that it won’t function for features that require it and the whole band needs to be replaced. What isn’t known yet is whether there will be decorations to place on the bands, or “designer” bands available for an upcharge. And I like how Disney refers to gray as “Iconic Gray” to make it sound spiffy…but it’s just gray. Don’t go looking for these online yet though…they are not yet available to guests. WDW Magic is reporting that MagicBand testing – including full features of MyMagic+ such as Fastpass+ and touch-to-pay, is taking place, although it seems limited to pre-selected guests staying at Animal Kingdom Lodge and going to the Animal Kingdom park. I have not seen any reports from any participants yet, nor any from a rumored test with Boardwalk Inn guests that was supposed to have happened already. It remains to be seen how this all works out.